Chicken cutlets are to most Italian families like, well, like pasta and tomato sauce is to Italian families. They were always in the fridge when I grew up. I could run in and grab one as a snack and head back to the couch to watch TV. My mom Lisa would make my brother, dad, and me sandwiches on the weekends, with provolone and garlicky broccoli rabe. With olive-oil slicked lips taking bites from the roll with long, strings of broccoli rabe hanging out, the kitchen was filled with sounds of satiated satisfaction. Though I don’t live with my parents anymore, I’m not too worried because I have Bennie’s Bread & Italian Market. On the days where I miss eating chicken cutlet sandwiches with my family, I head to directly to the corner of 12th and Asbury, walk through the glass door and into Bennie’s. One cloudy (and rarely quiet) Friday afternoon Bennie’s owner, Ralph DiClemente led me into his kitchen to meet one of the cooks, Chris Gieza. The process of one of the most popular items on the menu lay on the table in front of him – you guessed it… chicken cutlets. You may be thinking that the perfect chicken cutlet is easy to come by. And with three bowls on there, one each filled with egg, flour, and bread crumb it does appears simple. But looks can be deceiving. Simple doesn’t mean easy and certainly doesn’t guarantee delicious. But at Bennie’s the chicken cutlet is a thing of beauty. He dredged the chicken in plain flour, then egg wash. The bread crumbs smelled delicious. Bennie’s kitchen smells like you are walking into your Italian grandmother’s on a Sunday afternoon. It smells like simmering tomato sauce and fresh baked bread, grated cheese and basil. The food not only tastes delicious but looks delicious too. 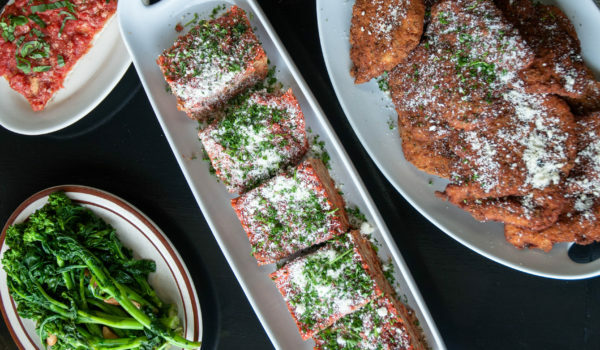 The eggplant parmesan has layers of fried eggplant so thin and perfect it looks like they were put together like a game of Tetris. The eggplant is Ralph’s mother’s recipe. It’s this attention to detail and passion that overwhelm me as much as the outstanding smell of Italian food cooking. The love for food and family was undeniable. Ralph’s children work at the market, too. The door chimed in the front and Ralph smiled as he greeted a Bennie’s regular. There’s a line on the Bennie’s website that says, “Bennie’s wants to invite your family to join theirs.” As I watched Ralph hand his customer a bag of the famous Bennie rolls – the shop stopped feeling like a well, shop, and felt like a home. The door chimed again as the customer left, maybe to create her own chicken cutlet sandwiches for her family. 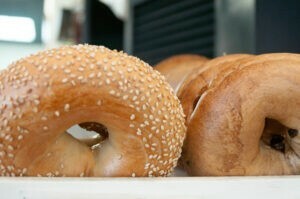 Bennie’s Bread & Italian Market started as a bread bakery in 1957 by Bennie who came from Italy in 1952 to work as a baker in New York City. He moved to Ocean City in 1957 and opened up the shop we stood in today. Before taking over Bennie’s, Ralph owned a pizza shop. He purchased his bread from Bennie’s, and the rest, as they say, is history. “When I ate [the bread], it tasted like home,” said Ralph. One bite of Bennie’s bread and Ralph was transported back to Sunday dinners in Staten Island, NY with his grandmother. Once he became owner, the pressure of keeping up the quality of the bread hit him. He spent a year as an apprentice with Bennie’s son, Lou to help the transition. Still, the first years were tough. The proof of Ralph’s determination to get those rolls right sits now behind the register of Bennie’s. Shelves of all different types of bread are there ready for the customer to choose which they want. Next to the counter sits the tomato pie, which is almost as famous as the Bennie roll. Its thick crust, juicy tomatoes, and savory olive oil make a perfect lunch, snack anytime of day. Also, there are stuffed breads. 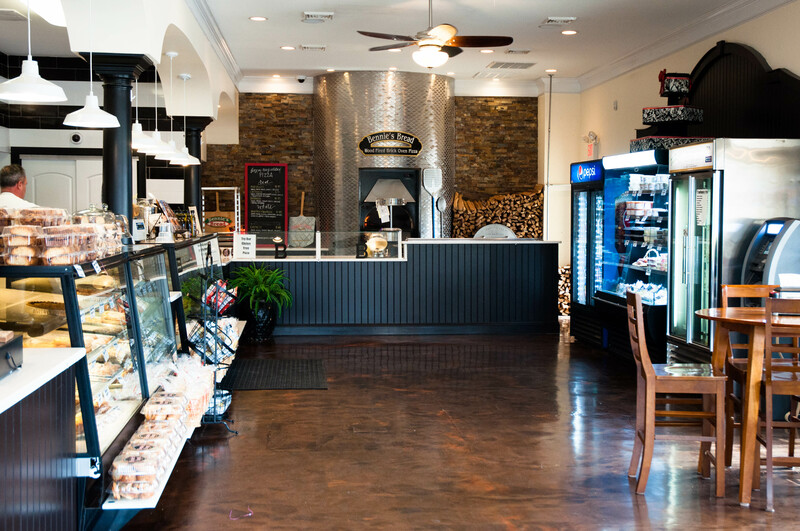 When Ralph expanded the bakery and added the market a few years back, they began serving hot and cold sandwiches, soups, sauces, wood-fired, brick oven pizzas, and more. Desserts like the cream puffs are like little Italian works of art. 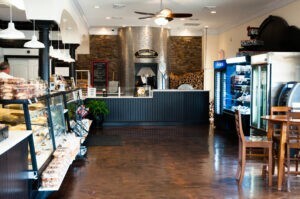 Walk in on any given day and chances are you’ll see Gianni behind the counter greeting you with a big, friendly smile. “I don’t know how I would do it without my son. He helps me with everything. I really don’t know how I would do it without him,” said Ralph. With a new store opening up in the North End at 4th and Ocean, Gianni will be helping now more than ever. The new location of Bennie’s will be up and running before Memorial Day weekend. More homemade sauces and soups, Italian meats and lunches will be served. – text and photos by Sam Florio. Edited by Stef Godfrey.